Huggins came in for high praise from CONCACAF officials, after attending a CONCACAF/FA Coaching course â Foundation level, last month in the Cayman Islands. In a letter sent to president of the St Vincent and the Grenadines Football Federation (SVGFF) Venold Coombs, Tanya Bialostozky requested that the SVGFF continues to support Huggins. âYou have a great coach with a lot of potential â¦ Hugginsâ contributions were invaluable for the development of the course through his participation, effort and the great attitude he always displayed towards his colleagues, as well as instructor Chris Dowham,â Bialostozky wrote. Huggins took over last January following the resignation of the technical director and head coach, Englishman Colwyn Rowe. Huggins was up to November 2011 the captain of the team and the under study to Rowe. Huggins, so far, has a record of four wins, two losses and three draws. In the first round of the 2012 Caribbean Football Union cup in St Lucia in October, St Vincent and the Grenadines got past Guyana (2-1) and Curacao (4-0), but lost to St Lucia 1-nil. This saw St Vincent and the Grenadines qualifying for the semi-final phase in Tobago last month. With Huggins at the helm for the first two matches in the group, St Vincent and the Grenadines drew 1-1 with both Cuba and host Trinidad and Tobago. 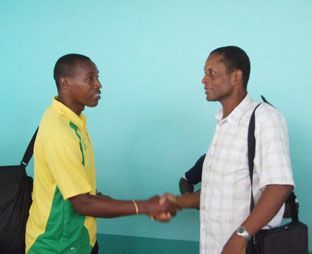 Huggins, though, missed the last match versus Suriname, having to jet off to the Cayman Islands for the coaching course. In that match, St Vincent and the Grenadines lost 0-1 and were ousted from the competition. Cuba and Trinidad and Tobago went on to advance to the finals in Antigua and Barbuda and qualified for the 2013 CONCACAF Gold Cup in the USA. Both were involved in the championship match, with Cuba emerging champions 1-nil. Apart from the Caribbean Football Union matches, St Vincent and the Grenadines has played four international friendlies, all on home soil. St Vincent and the Grenadines defeated Guyana 1-0, Barbados 2-0, and Antigua and Barbuda 1-0.